How Far Along? 13 weeks! Today marks the second trimester...time is flying! Maternity Clothes: Regular clothes are still fitting well, but getting a little snug. I'm basically living in these elastic waistband shorts (in multiple colors-don't worry), but I have a few dresses ready from Pink Blush for when the times comes. Stretch marks: I started using Earth Mama Angel Baby Body Butter and also Burt's Bees Mama Bee pretty early on to try to be proactive about this! I love the Earth Mama, but the Burt's Bees is easier to travel with because of the container, so I usually bring that one when I need to pack it and take it somewhere with me. Symptoms: Still lucking out in this department, and very thankful for such an easy pregnancy so far. I get out of breath more easily when running errands and feel bloated 24/7, but other than that I've been feeling really good and can't complain. My hormones these days can't say the same...they are out of control! Anything and everything will make me tear up. Cravings: Fruit smoothies, CARBS! (blueberry bagels-I am crazy about you), gummy bears, and wait for it...one night I begged Billy to bring home KFC. Coming from a vegetarian for multiple years prior to this, this is just weird for me to grasp. Billy actually called me after I texted him that request because he didn't know if it was serious or not. Yes love, it is, and I need it now. Gender: We find out exactly TWO weeks from today!! Nursery: Once we find out the gender, the gears will definitely get turning on this space! The room is empty and ready for us to get started on it and I'm so excited about every little thing...decorating, DIY projects, and to just watch it come together. What I Miss: At first I definitely had the wine + cold beer withdrawal, and there are still days that I would love to be able to have a glass but I'm not wanting it like I used to. I've been drinking La Croix daily which has helped so much (obsessed with this stuff!) and when I'm out with girlfriends, I will order cranberry, soda, with a lime and it's been keeping me content! Anything making you queasy or sick: No, thank you Baby K for this! 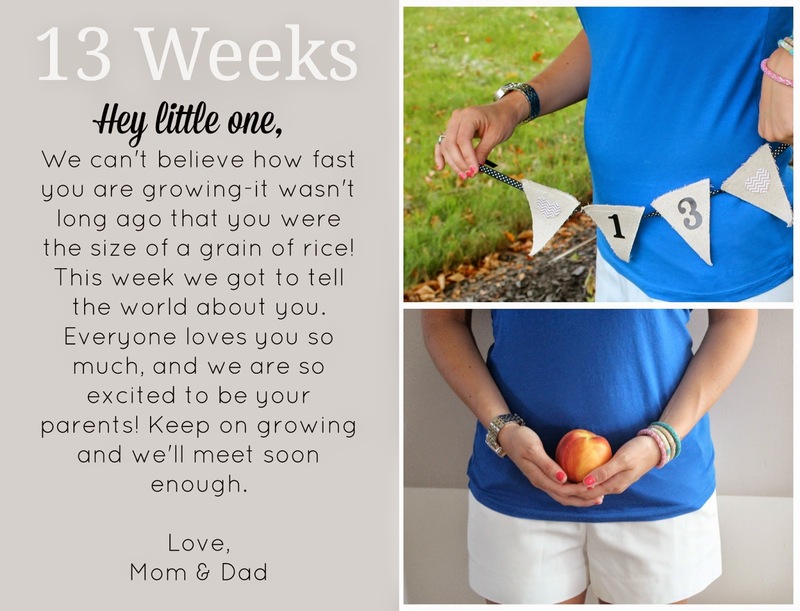 Best Moment This Week: Technically it was last week, but since this is my first weekly post I have to include it: telling everyone about Baby K after keeping it a secret for so long was pretty awesome and surreal. Also, this pregnant chick beat her husband in tennis for the 2nd time since being knocked up. This needs to be documented. Looking Forward To: My doctor's appointment next week (I love going to each and every appointment because it just makes me feel more reassured that everything is going good and since it's still new it makes everything seem more official/real! :)) and of course, finding out the gender! We are also going to be with all of Billy's family this weekend for the 4th of July and I'm excited to see some of his family that we haven't seen since announcing our news! ...and just because I'm not sure which layout I like best yet for these updates, including this one so hopefully I can make up my mind soon! Thoughts?! I hope they will get better as time goes on! I heart this so much!!! Good choice on the banner/no face shot lol. GROW BABY K, GROW!!! Love this!!! That little banner is such a cute idea! This is absolutely precious, Katie! The banner idea is so cute! I'll be 14 weeks tomorrow and all I want is carbs. I could eat CFA fries all day every day! Aww! I love your Bump-Date!! So cute! You are smart with the not worrying about hair and make up part... that is the part that is most tedious! So excited to follow along with you!! Adorable!!! I love your photos. I think I kind of like the layout of this bottom photo best!! Both are awesome though. Congrats again!! I love your pictures & how you're doing your bumpdates!! & Now fried chicken sounds SO good!! HAHA! Cute bumpdate pic! I am 18 weeks and pregnancy naps are the best thing ever. I was never a napper either but now I live for naps whenever I can get them. These pics are so cute, and awesome to not have to worry about hair/makeup...taking bump pics are a way bigger pain than they look, ha! Love the bump pics! Can't wait to see all of your nursery plans and DIY projects. I may have to start a pinterest board dedicated to my unborn kiddos for this. I'm obsessed with La Croix as well! Very cute bump photo!!!!! Happy 13 weeks! You are almost out of that first trimester (I think? right? 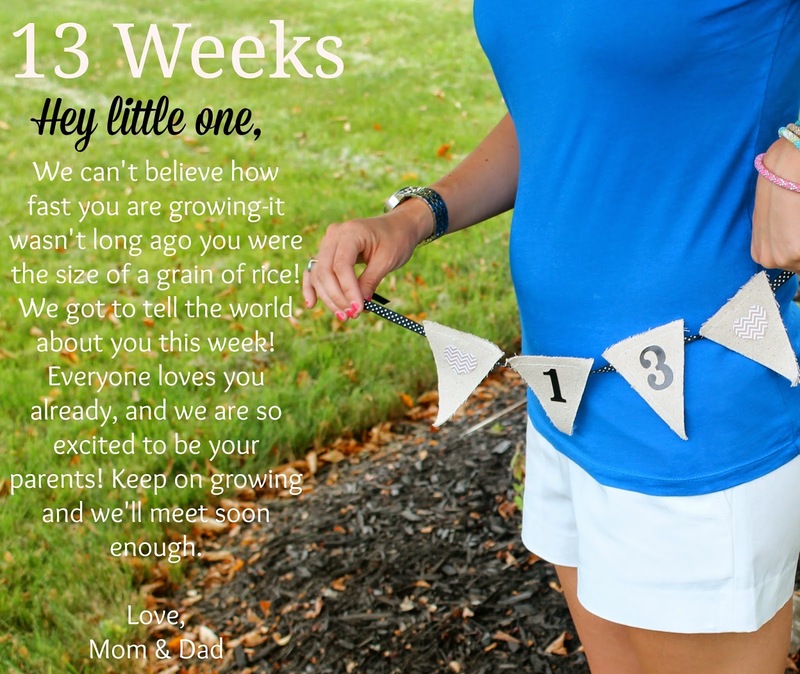 14 weeks starts the 2nd?)! Yippee! You look great mama and really adorable photos! and naps are so important and the best. I made the mistake and missed a spot underneath my belly with the body butter and 1 big stretch mark- it was sorta funny and went away but I still can't believe I missed a spot. Cute Bump Date! I'm a new follower and look forward to reading about your journey! I'm 12 weeks myself. Cute way to capture each week and especially smart to keep the hair/face out of it. I didn't think of that before doing mine, dang it. Haha. I've been eating blueberry bagels for breakfast everyday since finding out I was pregnant! So good! Love that your bump is showing!! So cute ! HOW CUTE ARE YOU?! I love the little notes. Both layouts are precious & something I have never seen before. I'm so excited to follow along your journey. Adorable! This is kind of genius with the no face/hair thing! Please still do outfit posts though! My favourite of this is happy with a side of psycho chick. So, so true. I am so happy and then every once in awhile just burst into tears over nothing.